The American University of Beirut (AUB) is pleased to announce a donation of $32 million from Jamal Daniel and The Levant Foundation toward the University’s Medical Center expansion. This gift represents the largest single donation to AUB in its 147 year history. The gift is in support of the AUBMC 2020 Vision, a comprehensive project that will transform the delivery of health and medical care in Lebanon and the region. The AUBMC 2020 Vision initiative includes the construction of new clinical and research facilities, acquisition of state-of-the art equipment for research, diagnostics and treatment, and the ongoing recruitment of leading physicians and specialists from around the world. It is the university’s most ambitious project since the founding of the medical center in 1902. The extraordinary gift is from The Levant Foundation, founded by Jamal Daniel in Houston, Texas. Daniel is an accomplished international businessman with over 30 years of experience managing global investments in oil and gas, telecommunications, high technology, media, manufacturing, and real estate. He is an esteemed member of the International Advisory Board of AUB and holds other board positions including Chairmanship of the Board of Al-Monitor, a media website based in Washington, D.C., and an honorary membership of the Board of Trustees of Balamand University in Beirut. He previously held positions as a member of the Board of Directors of Pepperdine University in Malibu, California, and the Board of the Conrad N. Hilton College of Hotel and Restaurant Management in Houston, Texas. Mr. Daniel has long been considered by AUB for a seat on its Board of Trustees, but he has indicated his inability to accept due to his many business commitments. The Levant Foundation works with universities, institutions of fine art, and religious and research institutions to support artistic, academic, and educational programs. Personally and through The Levant Foundation, Daniel has provided significant grants and endowments to the American University in Washington, D.C., the Edmund A. Walsh School of Foreign Service at Georgetown University, the George Bush School of Government and Public Service at Texas A&M University, the University of Texas Press, and the Foundation for Interreligious and Intercultural Research and Dialogue based in Switzerland. In gratitude for this unprecedented gift to AUBMC, AUB will name a major new medical building in honor of Daniel’s parents. 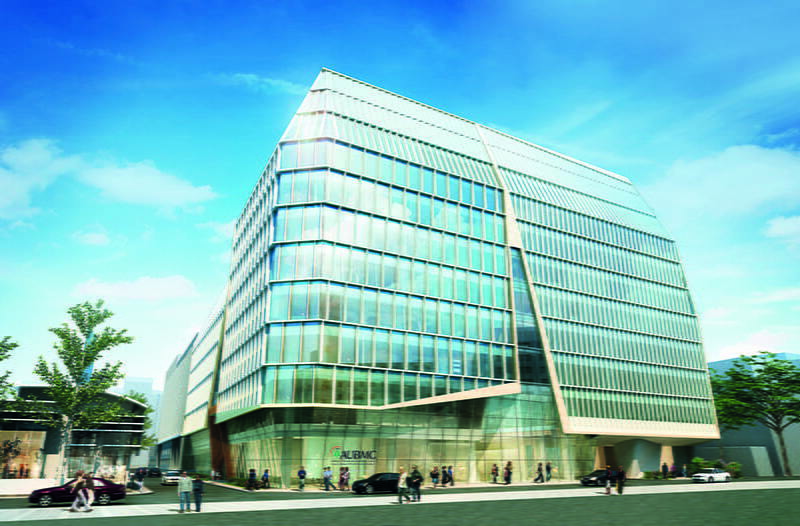 Currently under construction, it will be known as the “Halim and Aida Daniel Academic and Clinical Center.” With a projected completion date of 2016, the 14-story academic and clinical center will be the most modern medical building in Lebanon, housing a variety of outpatient centers as well as major academic centers for teaching and clinical research in areas including psychiatry, oncology, ophthalmology, heart and vascular diseases, and otolaryngology. There will also be an outpatient day surgery and a simulation center for education, as well as a ground floor exhibition area and conference room bearing the name Al-Monitor.